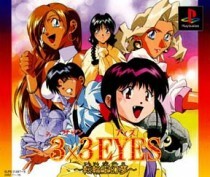 The entry '3×3EYES – 転輪王幻夢 – / King Record [Movie Adventure] (PS)' was posted on 2010/08/21 at 22:00	and last modified on 2015/12/06 at 11:40, and is filed under Game Soft. You can follow any responses to this entry through the RSS 2.0 feed. You can leave a response, or trackback from your own site.